Indians, Stagecoaches and a Caddy! Oh my! In honor of the summer season when more people are taking vacations and exploring, I’ve posted a travel article I wrote about one of my favorite museums: The Miami County Museum in Peru, Indiana. This is the type of museum that makes you feel at home. But don’t think it’s full of small-town stuff! There’s a neat Cadillac that once belonged to a hometown boy who made it big (Yes, you’ve heard of him! ), stagecoaches used in Western movies, mocassins worn by a small white girl who was raised by Indians. There’s more, but why don’t you read the article and go visit the museum? Let me know if you do and what you think of it! Cadillac owned by Peru native and international musical composer Cole Porter. When the Miami Indians were forced to move out of the area aroundPeru,Indiana, to reservations inKansasin 1846, they left remnants of their presence. Much of their lifestyle is on display at the former Senger Dry Goods store, which today serves as the Miami County Historical Museum in Peru, Indiana. One of the most unusual native American artifacts in the museum is a tiny pair of 200-year-old moccasins worn by a white girl who was kidnapped in 1778 from her home by the Delaware Indians inWilkes-Barre,PA.The Indians carried 5-year-old Frances Slocum through Pennsylvania and Ohio until finally settling in Miami County. Young Frances was eventually raised by theDelawareand adapted to their ways. She grew up peacefully, eventually marrying an Indian chief and raising a family. Her white family found her after many years of searching when she was an old woman. She refused to leave her Indian family and died happily in their midst. Other Miami Indian artifacts on display at the museum include pieces of clothing, jewelry, weaponry, and household pieces. Circus memorabilia fills the Miami County museum. Another popular exhibit at theMiamiCountyMuseuminvolves the circus. Circus life has been and continues to be a part ofPeru’s history. Following the Civil War, aPerunative, Ben Wallace, bought a circus from an owner who had gone bankrupt. At one point Wallace teamed with a partner to form the Hagenbeck-Wallace circus. One of their ornate circus wagons, used to transport and exhibit wild cats as they traveled throughout the Midwest, is on display theMiamiCountyHistoricalMuseum. Restored to its former beauty with bright colors and pictures of animals painted on its sides, the wagon greets visitors with excitement and nostalgia upon walking in the front door. Authentic costumes worn by circus performers also gives visitors a taste of what circuses were like from a century ago. Note: An ongoing part ofPeru’s circus history continues each July as the town ofPeruhosts a Circus City Children’s Circus Festival. For more than 50 years, children from the area have performed during one week each summer such stunts as flying trapeze and tightrope walking for the public. Tom Mix, Hollywood film star of Westerns, lived in Peru. A stagecoach used in his movies is on exhibit in the Miami Co Museum. To add more diversity at the museum there’s a stage coach owned by Tom Mix, the silent movie star of the early 1900s, sitting just inside the front door of the museum. Originally used by passengers to travel throughYellowstoneParkin the early 1900s, theConcordstagecoach caught the eye of Mix when he starred in Westerns. Upon joining the circus, Mix used the coach in the Wild West part of the circus performances. As if cowboys and Indians weren’t enough, the MiamiCountyHistoricalMuseumalso contains personal items that once belonged to one of the 20th century’s most beloved songwriters – Cole Porter. Porter, who was born inPeruin 1891, gained fame with songs like “Begin the Beguine” and “Be A Clown.” While living inParisduring the early 1920s, Porter had a black Cadillac shipped over to him. 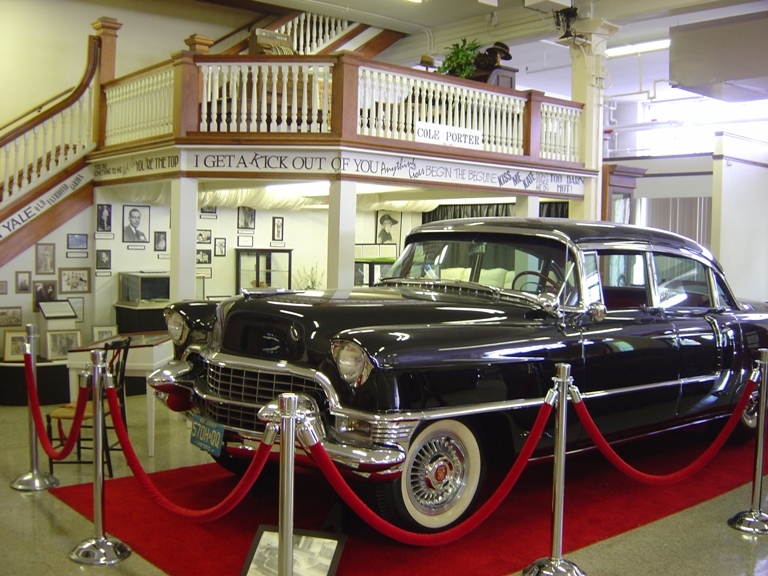 After Porter died, the car was used in the movie, “The Godfather.” The Cadillac now sits on the first floor of the Miami Co Historical Museum, welcoming visitors as they come through the front door. The museum also owns Porter’s Grammy from 1989, posthumously given, and some of his sheet music. Porter is buried inPeru. The town celebrates Cole Porter Festival during the second weekend in June. The second floor of the museum has a more traditional feel with its design to look like a street inPerucirca 1910-1920. With brick streets and old-fashioned street lights, the 18 shops include a chapel, dental office, one-room school house, pharmacy, law office, and music store. People can stroll through the displays and wonder what it was like to run a business, get a tooth fixed or attend school with other grades. Hours: Tuesday- Saturday 9am – 5pm. Speaking at Norwell High School was an adventure! I just wrote an article about Homer and his military career. He has a copy. I’ll try to post a copy on my blog soon. You’ll always be glad for the things you did w/ your dad. He was a wonderful man.